A job applicant looks at job listings for the Riverside Hotel at a job fair hosted by Job News South Florida, in Sunrise, Florida. The state’s unemployment rate rose to 3.3 percent from 3.2 percent, according to the U.S.Bureau of Labor Statistics. North Dakota also saw a 0.1 percentage-point rise from August to September, while Colorado and Wyoming each saw a 0.2 percentage-point rises. 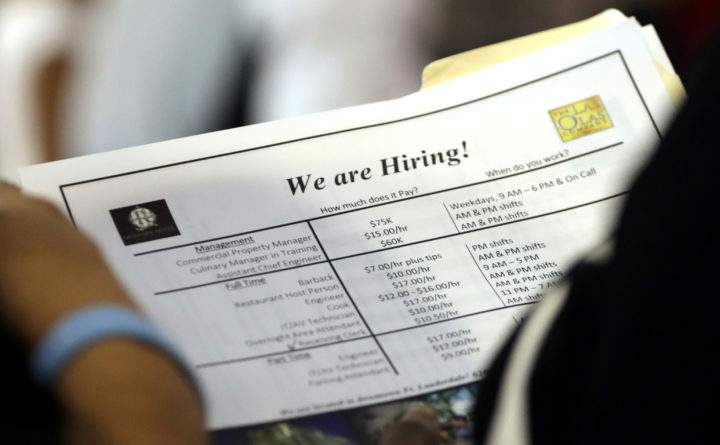 Nine states saw unemployment rates fall in September and 37 states saw stable rates. The national unemployment rate declined by 0.2 percentage points from August to 3.7 percent and was 0.5 percentage points lower than in September 2017. On an annual basis, 16 states had jobless rate decreases from a year earlier and 34 states and the District of Columbia had little or no change. For a roundup of Maine’s latest business news, click here to sign up for the BDN’s Business newsletter, sent out every weekday morning.